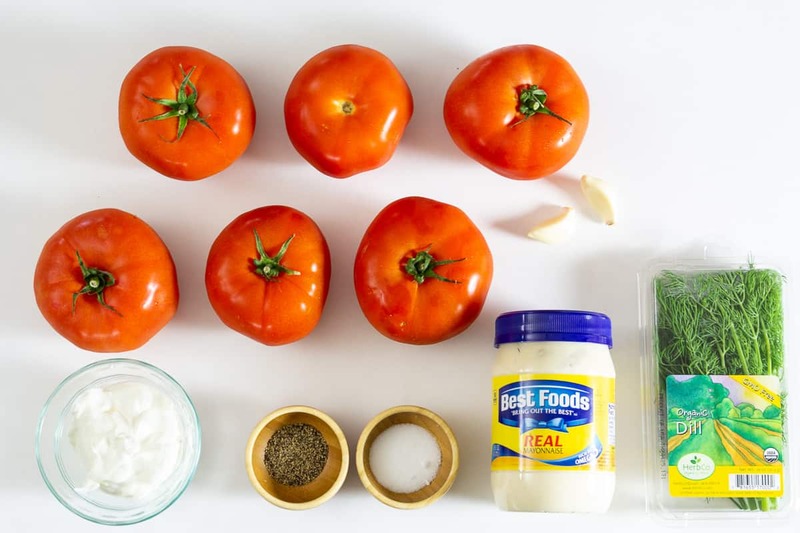 A Tomato Salad Recipe with the juicy vine-ripened tomatoes and creamy dressing is the ideal addition to your summer dinner table this year! If you are looking for a bit heavier option, you’ll love our simple Tri-Color Pasta Salad! During the summer most people tend to make more salads. They’re light and refreshing, especially on really hot days. This salad is exceptionally easy and has very few ingredients that you probably already have at home right now. This basic salad practically goes with any meal. I think it pairs great with my Grilled Chicken Kabob for an easy healthy meal. Of course, you may also like my grilled corn salad as well to round out a meal with tons of delicious and easy flavor. Following the directions in the printable recipe below, combine ingredients to create the dressing. 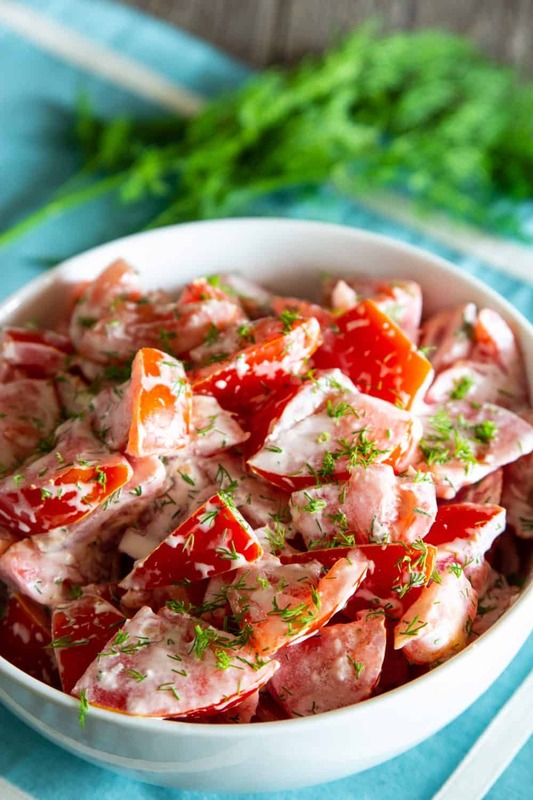 Clean and prepare the tomatoes and mix with the dressing before refrigerating. This recipe is best when served cold. As I mentioned, salads are a perfect addition to your meal plan during the warmer months. This is especially true if you have your own vegetable garden and will have a lot of fresh produce on hand. 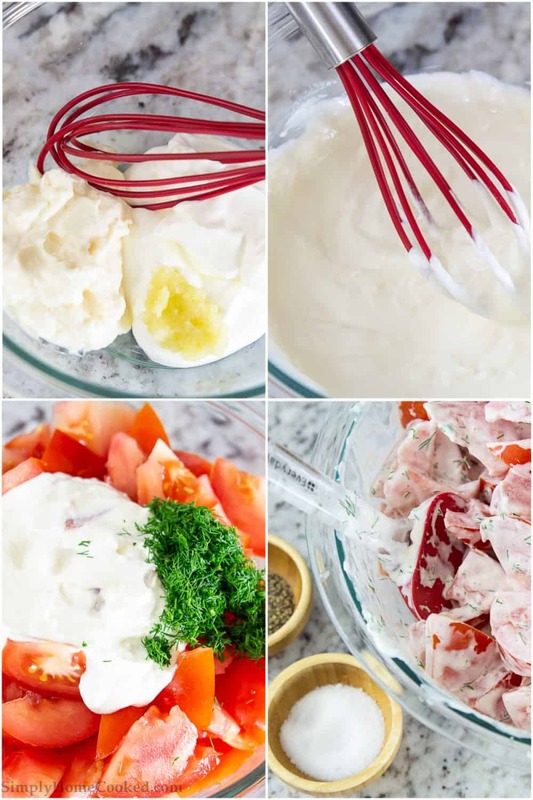 If making a traditional side salad or dinner salad, make sure to keep the ingredients on hand to make this Buttermilk Ranch Dressing recipe. For an option that can be a full meal, the Antipasto Salad is a perfect choice, but if you just want a nice veggie filled salad you can’t go wrong with this Broccoli Cranberry Salad.